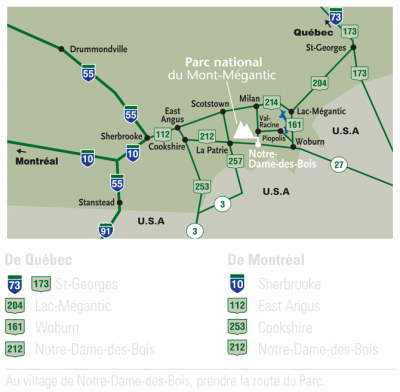 The ASTROLab is located at the entrance of the Parc national du Mont-Mégantic. Mount Mégantic is about 250 km from Quebec and Montreal, and it takes more or less 2h45 of driving. It's about 1 hour from Sherbrooke and 40 minutes from Lac-Mégantic. Attention : If you want to go to Lac-Megantic town first, you will add 1 h to your trip. 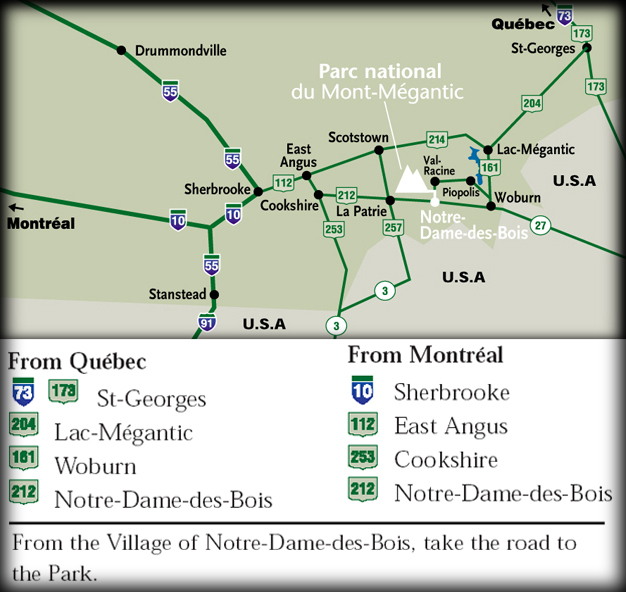 If you want to get to the Park by the shortest road, entering East Angus, don't follow the indications for Lac-Mégantic. See the map and the directions below. The new Sector of the Park is located between Val-Racine and Scotstown. We count 30 minutes by car to drive to the other Sector. At Franceville Sector, you will find a welcome centre and campsites with services.